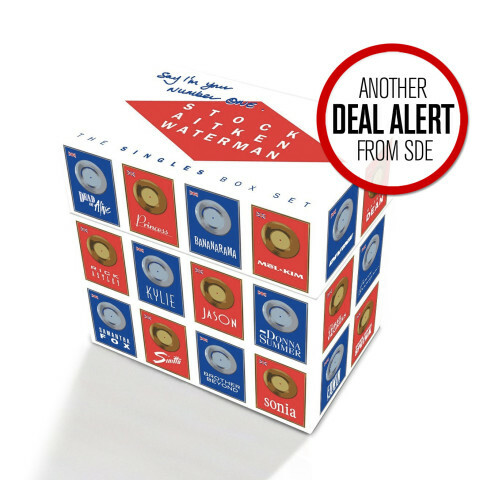 Another great deal for the new year, as Amazon UK offer the 31-disc Stock Aitken Waterman box set – Say I’m Your Number One – for the best price to date! This set is just £60 right now (10pm GMT, 2/1/17) which is less than £2 per CD and about HALF the price it was originally. This set has a phenomenal amount of content – over 250 tracks – with singles and remixes from Divine, Dead Or Alive, Bananarama, Mel & Kim, Rick Astley, Brother Beyond, Kylie and Jason and much more. Still waiting for the three Judas Priest S/A/W tracks to get released. Maybe as a RSD thing of some sort. Belinda Carlisle ‘The CD Singles 1984 – 2014’ 29 x CD Box Set is currently £39.99 on Amazon UK, another great price drop! Just curious. Do people actually listen to these discs like normal albums? E.g. 14 versions of Happenin’ All Over Again in a row? Or do you just select the mix you want, and then switch CD? Given the difference in time zones from where I am, I hv missed all alerts that came my way.. (at least those I cared for). This is an exception. Order placed, thanks Paul. Yes, not going to relish all discs…hate them or love them pwl were one of the music forces then though.. Always seems that when I wait for a discount, they go out of stock and any unopened copies I can find they’re asking two or five or ten times as much, yet when I get one early, it’s not long before they’re going for 50% off. Still, I’d never have forgiven myself if I’d missed out on the Laura Branigan disc, so it was worth it! One hell of a bargain for a really great, excellently-realised boxset. It’s a shame if the rumours that there isn’t going to be a Vol.2 are true. The visitors went home, I got paid, and now this! I nearly bought this a month ago, but had to cancel due to low funds. :( I didn’t think I’d get the chance again so soon – and at an even cheaper-than-before price! Thanks again Paul! Managed to grab one for $68.92 sent to US. Looking for a great price and you have emptied our wallets again. Happy New Year to you and your family! Oh that box is ghastly pure cheese. Fab! Thanks for sharing this. Order has been placed. John — someone on Discogs was selling individual discs out of a set, might want to check around. Someone on eBay was doing the same for pennies – Even combined postage. Got most of the ones I wanted that way but I still might be tempted by the full box if it goes to £40ish.